When looking at a ketogenic diet and ketosis, it’s common for some people to confuse the process with a harmful, more extreme version of this state known as diabetic ketoacidosis. 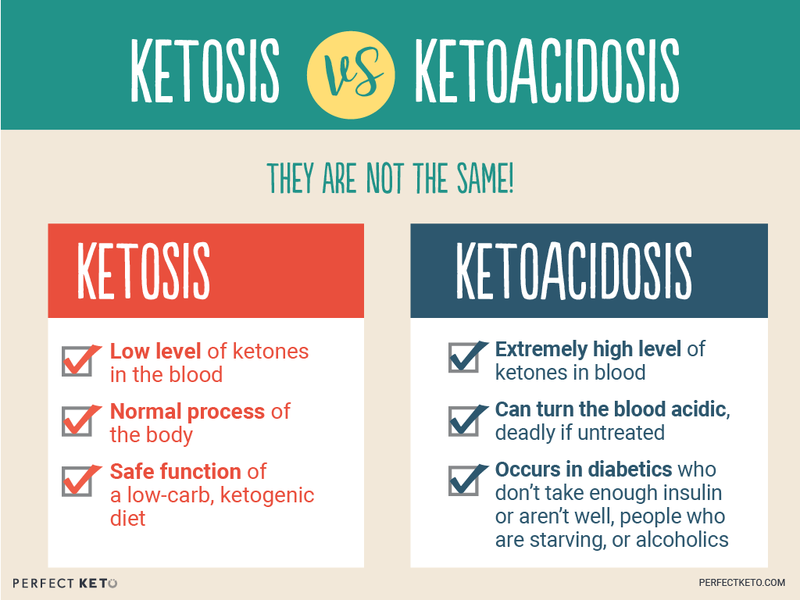 But there are a lot of misconceptions out there about ketosis vs ketoacidosis, and it’s time to shed some light on the subject by looking at the (very big) differences between the two. Ketosis is a metabolic state where the body is primarily using fat for energy instead of carbohydrates. Burning carbohydrates (glucose) for energy is the default function of the body, so if glucose is available, the body will use that first. But during ketosis, the body is using ketones instead of glucose. This is an amazing survival adaptation by the body for handling periods of famine or fasting, extreme exercise, or anything else that leaves the body without enough glucose for fuel. Those eating a ketogenic diet purposely limit their carb intake (usually between 20 and 50 grams per day) to facilitate this response. That’s why the keto diet focuses on very low carb intake, moderate to low protein intake, and high intakes of dietary fats. Lower protein is important because it prevents the body from pulling your lean muscle mass for energy and instead turns to fat. Ketone bodies are released during ketosis and are created by the liver from fatty acids. These ketones are then used by the body to power all of its biggest organs, including the brain, and they have many benefits for the body we’ll get into later. But first, let’s address a common misconception around ketosis and it’s confusion with ketosis vs ketoacidosis. Ketosis Vs Ketoacidosis: What’s the Difference? Ketosis is a natural process created within the ketogenic diet. Diabetic ketoacidosis (DKA) is an extreme dangerous metabolic state that is most commonly seen in people with type 1 diabetes and sometimes type 2 diabetics if they aren’t properly managing their insulin and diet. DKA is one of the main causes of poor diabetes management (for both type 1 and type 2 diabetes, but especially type 1), including not getting enough or using the correct amount of insulin. DKA is also often the first sign someone has diabetes. So if you do have diabetes or at risk for developing it, be sure to always follow your doctor-recommend blood sugar management routine. Those with diabetes should use caution if they experience any of the triggers above and should see their doctor immediately if they have any of the symptoms of DKA. However, nutritional ketosis while eating a well-balanced keto diet should only produce low levels of ketones that are safe for the average person and not a cause for concern. The best way to determine whether you’re in ketosis and the level of ketones in your body is by testing for them. When you’re in ketosis, ketones that aren’t used will spill over into different areas of the body: the breath, urine, and blood. Anything between 0.6 and 3.0 mmol is usually optimal ketone range for someone on a keto diet. Ketone levels during diabetic ketoacidosis, like we just talked about, are 3-5 times higher than the healthy ranges for nutritional ketosis. 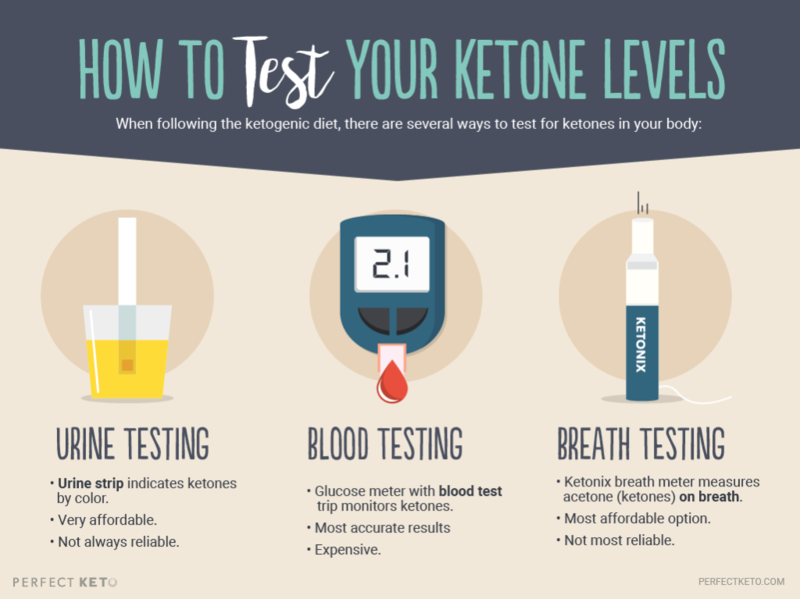 Although you can get tested for ketones in a lab, it’s not necessary because there are several at-home tests you can do for almost immediate results and a fraction of the price. Testing ketones in the urine is a quick, simple, and affordable option. Using specific urine strips you can find at most pharmacies, your ketone level is indicated by color after peeing on each strip. The downside of this method is that urine strip readings can be affected by other factors and aren’t always reliable for the most accurate measurement of ketone levels. However, they are helpful for those new to a keto diet and just interested in seeing if they’re in ketosis. In contrast with urine testing, blood tests for ketone levels are very accurate. Using a blood glucose meter and a test strip, you draw a small amount of blood for measurement. If you’re going to use this method to test often, be warned that it can be pricey. Each test strip can cost between $5 and $10 dollars, and that adds up! Like urine testing, measuring ketones on the breath is not the most reliable method, but it’s helpful when used with other methods. Breath tests take place using a Ketonix breath meter to test the amount of ketones present on your breath. The advantage of this method is that once you purchase the meter, there are no extra costs involved with repeated tests. Weight loss and fat burning: The keto diet has been shown to bring better weight loss results than a calorie-restricted or normal low-carb diet. This is likely due to the fact that those on a keto diet are already using fat as their main fuel source, so it becomes easier to burn fat stored within the body as well. Another reason people see good weight loss results on the keto diet is because it’s satisfying and satiating due to the high fat and low carb intake, which can help you feel less hungry and not have to count calories or portion sizes to lose weight. Plus, cutting out the refined carbs and sugars normally present in a traditional Western diet helps avoid crazy spikes in blood sugar that can lead to the feeling of being hungry again soon after eating. Type 2 diabetes: In people who are insulin resistant due to the damaging effects of the Standard American Diet, a keto diet with proper diabetes management can be a remedy for restoring insulin sensitivity and normal metabolic function. Neurological conditions: Ketosis has been shown to help reduce seizures in people with epilepsy, especially kids. It may also have benefits for people with Alzheimer’s disease, Parkinson’s, or other degenerative cognitive diseases due to the neuroprotective effects of ketones and, likely, the rich nutrition of a ketogenic diet. Brain performance: There is some evidence suggesting that a keto diet can have benefits for productivity and mental performance [link to “Keto for Productivity and Mental Performance” article], as well as improving memory and mild cognitive impairment. Physical performance: Becoming adapted to using fat for fuel, known as keto-adaptation, while on a keto diet can have benefits during physical activity. Those who engage in long periods of exercise may see benefits from ketosis because it helps the body burn fat for energy more quickly when the body has used up its glycogen stores. Nutritional ketosis shouldn’t be confused with the harmful effects of diabetic ketoacidosis. When followed property, ketosis on a healthy keto diet has many benefits for weight loss, health, and overall performance.